Navi lasciano il porto di Hong Kong mezze vuote. Numerose imprese chiudono i battenti. Milioni sono i nuovi disoccupati. Problemi e ritardi di pagamenti nel traffico internazionale con la Cina. Il governo cinese interviene per sostenere le esportazioni. Altri paesi, come l’Indonesia, prendono le stesse misure. Segue l’articolo del New York Times in inglese. HONG KONG — At the docks here, the stacks of shipping containers that used to loom above the highway overpass are gone. Logistics managers say they negotiate deeper discounts every week on ships that are leaving half empty. In nearby Guangdong province, so many factories are shuttering without paying employees that some workers are resigning pre-emptively and demanding immediate pay before their employers go bankrupt. Those are the effects of millions of Americans losing their confidence in the economy, feeling poorer and, as a result, pulling back on their spending. American retailers, after suffering a dismal holiday shopping season, are delaying payment for Chinese goods 90 or even 120 days after shipping, in contrast to the usual 30 to 45 days, forcing their suppliers to try to borrow more money to cover the difference. Some Chinese suppliers who cannot raise the money — many already operate on thin margins — are going out of business. At the same time, retailers are demanding that exporters show that they have strong balance sheets and will not go bankrupt before completing orders. Exporters, worried the retailers will fail before paying for their purchases, are reluctant to let goods be loaded on ships. And banks, for the same reason, have cut back on guaranteeing retailers’ payments to exporters. Mr. Fung estimates that 10,000 of the 60,000 factories in China owned by Hong Kong interests have closed or will close in the coming months. Other business leaders say the toll may be even higher and that factory closings are an even bigger problem among mainland Chinese businesses because these tend to be smaller and more poorly capitalized than those owned by Hong Kong businesses. Government statistics show that Chinese exports slipped 2.2 percent in November when calculated in dollars, after seven years of rapid growth. But figures in dollars do not come to close to capturing the real depth of the downturn. Convert the export figures into China’s own currency, a much better measure of the effect on China’s economy, and exports plunged 9.6 percent last month. Factor in inflation over the last year and the plunge was 11.4 percent. Consumer electronics manufacturers have been hit the hardest, according to customs data. “No one has any money any more, so demand for our mini hi-fi systems has declined a lot,” said Lion Yuan, the sales manager at the Shenzhen Yidashi Electronics Company, where exports have dropped 30 percent in the last year. 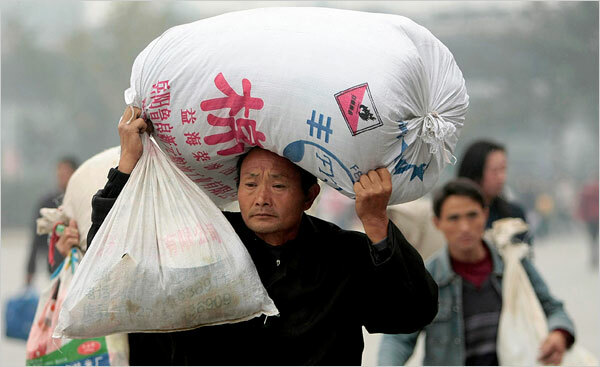 In the last two weeks, Chinese officials have announced a series of measures to help exporters. State banks are being directed to lend more to them, particularly to small and medium-size exporters. Government research funds are being set up. The head of the government of Hong Kong, Donald Tsang, plans to seek legislative approval by late January for the government to guarantee banks’ issuance of $12.9 billion worth of letters of credit for exports. Particularly noteworthy have been the Chinese government’s steps to help labor-intensive sectors like garment production, one of the industries China has been trying to move away from in an effort to climb the ladder of economic development with more skilled work that pays higher wages. But now China has become reluctant to yield the bottom rungs of the ladder to countries with even lower wages, like Vietnam, Indonesia and Bangladesh. China has been restoring export tax rebates for its textile sector, for instance, which it had been phasing out. Municipal governments have also stopped raising the minimum wage, which doubled over the last two years in some cities, peaking at $146 a month in Shenzhen. “China will resort to tariff and trade policies to facilitate export of labor-intensive and core technology-supported industries,” Li Yizhong, the minister of industry and information technology, said at a conference on Dec. 19. Increased export incentives by China have the potential to create a trade issue for President-elect Barack Obama, particularly regarding textiles. American quotas on the import of a wide range of Chinese garments are set to expire on Thursday. Even before the Chinese began announcing their latest programs for exporters, the United States filed a legal challenge on Dec. 19 at the World Trade Organization, accusing China of having already provided illegal subsidies to exporters in a long list of industries as part of a program of trying to build recognizable export brands. China denied on Dec. 23 that there were any illegal subsidies, saying that many countries tried to help exporters and that its actions were no different. In a letter to the National Council of Textile Organizations on Oct. 24, Mr. Obama stopped short of promising any protection from Chinese imports but said that he favored close monitoring of China imports. “China must change its policies, including its foreign exchange policies, so that it relies less on exports and more on domestic demand for its growth,” he wrote. But shifting toward a greater reliance on domestic demand is not easy. Chinese households have one of the world’s highest savings rates because the country’s social safety net is in tatters, with families receiving scant government help with education costs, medical care and retirement; the average hospital stay costs the equivalent of two years’ wages for the average Chinese worker. Important bureaucratic obstacles also exist. Chinese factories are allowed to import equipment while paying little or no duty, provided that the equipment will be used only to produce goods for export. Obtaining approval to switch the same equipment to making goods for the domestic market can take two years and require the payment of much of the import duties that were previously avoided, a payment that many factories cannot afford. China’s measures to help exporters are starting to cause concern in other Asian countries that compete with it, and raise the risk of a protectionist reaction against China. Indonesia, one of Asia’s largest markets, is preparing to impose a series of administrative measures on Thursday that are meant to reduce smuggling but will have the practical effect of making it harder to import Chinese goods. In Indonesia, the third most populous country in Asia after China and India, the government is already acting to limit imports of garments, electronics, shoes, toys and food — five large categories in which Indonesian producers are struggling to compete with China. Starting in the new year, importers of these products will have to be registered with the government, use only five designated ports for their shipments, arrange for a detailed inspection of goods before they are loaded on a ship or plane bound for Indonesia and then have every single container exhaustively inspected on arrival by Indonesia’s notoriously slow customs bureaucracy. The plan, intended to comply with W.T.O. rules, was adopted after heavy lobbying by Indonesian manufacturers and labor unions. Boediono, the governor of Indonesia’s central bank, who uses only one name, said that Indonesia would be watching China’s policies but added that he hoped Indonesia could stay competitive. At less than $120 a month, industrial wages in export zones near Jakarta, Indonesia’s capital, are slightly below those in coastal regions of China, and have not shown the same steep increases in wages.